Where Friends Gather for Sewing Fun! Welcome to our web site, the friendly staff at Mad B's Quilt and Sew invites you to visit us at our quilt store any day of the week! We are here for you Monday through Sunday for fabric, supplies, machines and more! 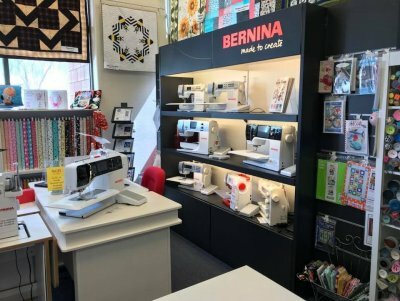 Our quilt store features a complete selection of Bernina Machines and Accessories. Bernina machines have an outstanding reputation for precision and premium quality sewing. Mad B's provides in-depth training on all machine purchases, on your schedule. We also have shelves of over 2000 bolts of fabric for your projects, fat quarters, and pre-cut kits to make your quilting easier. These include 100% quilting cottons, batiks, flannels, and extra wide quilt backing fabric. We carry a variety of notions, sewing supplies, sewing threads, decorative threads and crystals for glitzing your projects as well as a large selection of embroidery designs, including OESD embroidery take out, and a full line of OESD products for machine embroidery. Our Bernina Certified Tech is available to service your Bernina machine. A wide variety of classes and clubs are offered during the day, evening and weekend for adults and children. Thank you for visiting our website. Come visit the friendly staff at Mad B's Quilt and Sew!